Just about everybody is open to video communication, according to our Vision Research*. Car buyers of all ages are embracing video as a means to help them shortlist their next vehicle and facilitate making a purchase decision. CitNOW’s ‘Video in the automotive industry 2017’ report is the first of its kind which seeks to discover how video is influencing car purchase decisions. In 2017 over 7.5 million videos were sent from the CitNOW which were watched over 15 million times and rated at an average 4.8/5 by customers. It’s clear both the motor trade and car-buyers have embraced video. But, video isn’t the same to all car-buyers. CitNOW’s research revealed key differences between age groups and what they enjoyed about the video experience. In our series ‘Video across the Ages’, we explore the different attitudes across the generational divide to video and offer insight into the preferences, opportunities and challenges retailers need to know about when using video to communicate with their customers and car-buyers. In the third of our series, it’s those much-talked-about Millennials. Perhaps not surprisingly, the most receptive age group to video as an aide in the purchase journey were the 25-34-year-olds, those Millennials who came of age along with the internet and have embraced digital technology in all areas of their lives from communicating to making purchases including cars. This age group are likely to be establishing and building their careers and many will also have family commitments making time precious so convenient ways to help them make big decisions such as their next car are welcome. 1) Overcome scepticism: Millennials may have matured with the internet, social media and other aspects of the digital age. A video isn’t a surprise for them, it’s expected, and they can be a sceptical bunch. Growing up with the Internet means they are more aware of digital risks and they are cautious about sharing personal information. Studies have shown that when buying online 84% believe their personal data is not fully protected (source: LexisNexis Risk Solutions – as contained in the CitNOW report). 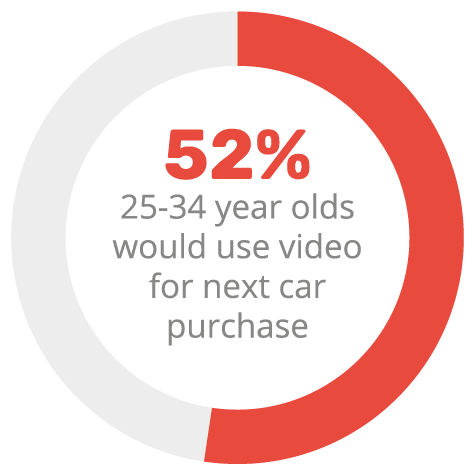 More than half (52%) of Millennials say they would use video when buying their next car. This enthusiasm for the transparency of personalised videos would help them overcome their aforementioned scepticism and build trust with the business, making them a key target for video communications for dealers. 2) Mixed experience, low brand loyalty: With some car buying experience, although arguably city dwellers particularly those living in London and the younger Millennials may have very little, they are unlikely to have developed a brand bias so are more open to considering their options. Low brand loyalty is both a threat and an opportunity. Use video to provide them with an experience which will be hard to beat anywhere else. Part of this is helping them make informed decision using engaging channels like video. 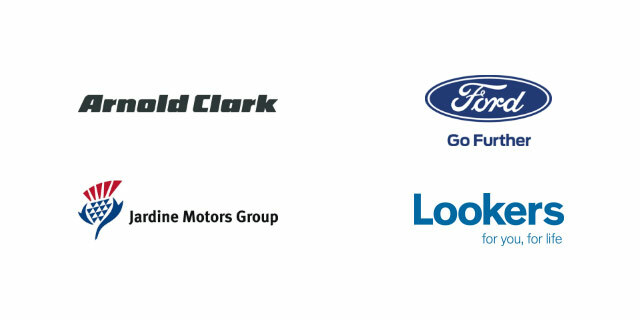 You can help them view a vehicle from the comfort of their own home and even provide options they may not have considered in their initial enquiry. They are likely to be more open-minded about the vehicle make, and model so make sure you show off stock that matches their needs. 3) Time poor, convenience rich: This age group are likely to be focused on building their careers, many will be at the stage in their lives where they work hard and play hard whereas others could well be embarking on the early years of parenthood. Either way, they are time poor. When car buying, the personalised video gives this age group back their valuable time. Viewing a three or four-minute video which highlights salient features means they can more readily draw up a shortlist. Anything that saves the busy Millennial time and helps develop a relationship with the business thereby building trust, would be welcomed. They may have come of age alongside digital but growing up side by side has meant this age group is more questioning of how companies use and store their personal data. This healthy scepticism can be advantageous though for video communicators as the ‘warts and all’ approach (such as filming the scratch on the alloys and providing a close up of the mileage) means they will appreciate the honesty. This group are also busy building careers and even creating their own families with many couples juggling the two, so anything companies can do to make their lives easier will be well received. 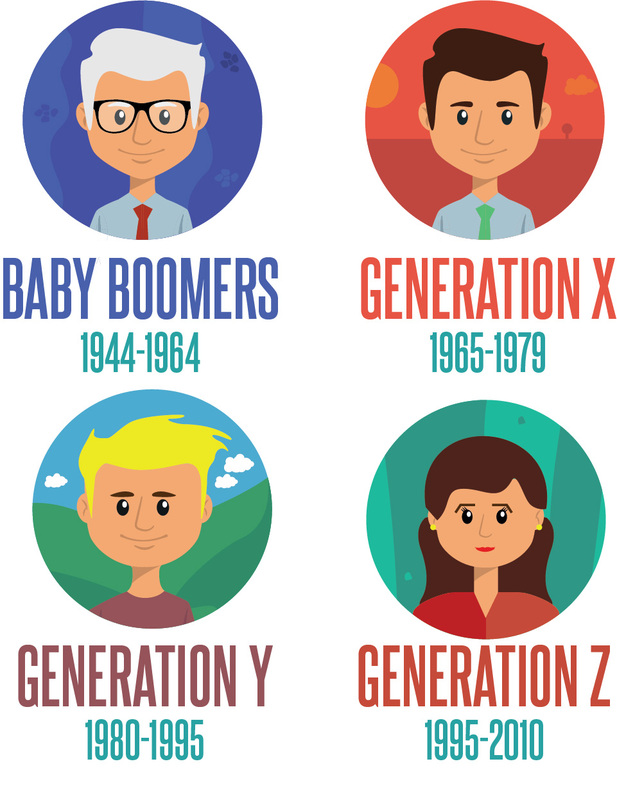 Read about what Baby Boomers and Generation X think of video in our previous blogs. *The Vision report combines survey responses from 2,000 UK motorists with video usage data from leading UK groups and brands. For the full picture of video across the ages you can download the full report here.